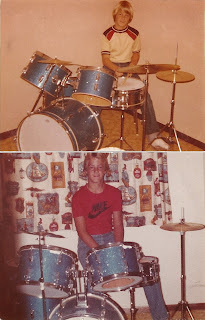 Fast forward 35 years, and I'm thinking I should have held onto that kit. After all, sparkle finishes are back, and I'm convinced that investing a little time into tuning up a set of quality drum heads would have been enough to get that little Pearl kit to sing! 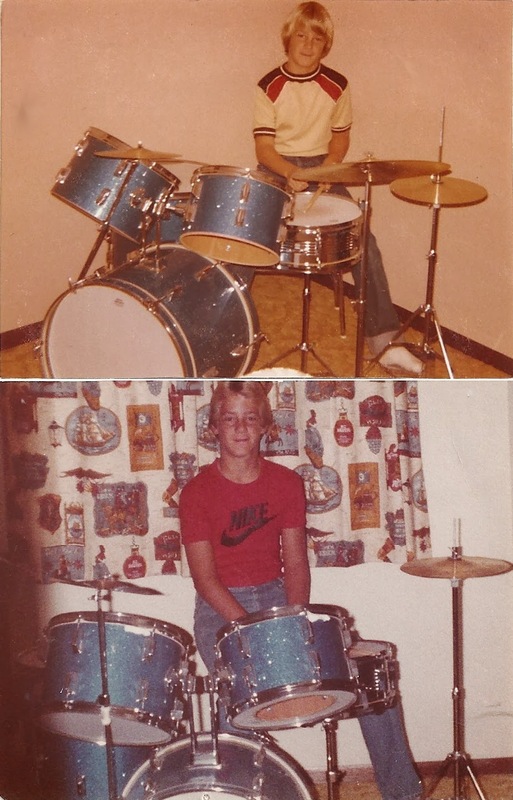 Since that first JCPenney/Pearl kit, I've owned a Slingerland "Country Roads" kit (with far too many oversized concert toms), a Yamaha DTXpress electronic kit, a Roland TD-12 electronic kit, a PDP X7 7-piece maple kit, and a PDP FS 6-piece birch kit. I still own the Roland and PDP kits, but I did pick up a couple of vintage 6.5x14-inch Slingerland chrome-over-brass snares that I play with my PDP kits. That old Slingy is what a snare drum is supposed to sound like--at least to my ears! In addition, over the years, I've owned and played individual drums and hardware made by Ludwig, Yamaha, Tama, Pork Pie, and DW. After that lengthy introduction, you are probably wondering if I'm ever going to get to the point tipped off by the title of this blog post. So, how do you go about selecting the right drum kit? Read on for the perspective of this semi-pro pop/rock drummer who has spent the past 35 years around drums. Programming note: We will cover electronic kits and cymbals in future posts--those are topics worthy of separate blog posts. In 2012, a drummer can acquire a new, decent quality, acoustic drum shell pack for $600-$800. Music stores in the U.S. carry a variety of mid-level products from Ludwig, Gretsch, Pearl, Tama, Yamaha, Sonor, Mapex, and PDP. Manufacturing methods are relatively consistent, so with decent heads, all of these kits can be tuned up to produce a great sound for the semi-pro gigging drummer. A career musician friend of mine who has spent a considerable amount of time setting up drums in professional recording studios confirms that many of these drums will also record well. If you have the money, you can go with a high-end kit from any of these manufacturers (DW in the case of PDP), but this blog post will focus on how to get the most for your money out of a mid-level kit. I personally am not convinced that the $2000-$3000 premium of a high-end kit buys you much if you know how to properly tune drums. Online drumming forums debate all the details--whether a manufacturer's shells are composed of North American rock maple or some lower Asian grade, whether rack toms should hang by tension rods, tuning lugs, or through a good old hole in the side of the shell, whether triple-flange or die-cast hoops make for a better sound, as well as whether tension rods with nylon washers and "virgin" bass drums (without pre-drilled tom mounts) justify larger withdrawals from your bank account. Most of these debates regurgitate hype created by a dozen drum major drum manufacturers all vying to position themselves for a share of your wallet. There are several features that you DO want to look for in your next drum kit. First off, many of today's mid-level kits utilize thin shells. Thin shells sound great because they resonate more easily and have an inherently lower pitch than thicker shells. However, they do not project as well and may not provide adequate volume for venues beyond the club setting. If you often play larger venues without drum mics, you may want to consider thicker shells--otherwise, I have not had any problems with my two thin-shell kits. I've found that thin shells are about the right volume for practice sessions as well, although I do typically mic up my bass drum so it doesn't get lost in the mix. So the first decision is to determine whether thin shells are adequate for you or if you need a thicker shell that will project. Secondly, take a look at the hardware provided with the kit. I am not of the opinion that you have a entry-level kit simply because your bass drum has fewer than 10 tuning lugs on each side--I've never had a problem tuning an 8-lug bass drum--but it IS sub par if your floor toms only have six lugs per side. Floor toms require enough attention when tuning that you don't want to be handicapped by uneven tension that can come from widely-spaced lugs. It may be possible to offset this issue somewhat with die-cast hoops, but a 6-lug floor tom is generally an indicator of a low-end kit. Another hardware concern--the hoops. You want a nice triple-flange or die-cast hoop (depending on your preference) to ease the tuning process and provide solid rimshots without cutting your sticks. The hoops on some low-end kits have little or no "roll" to the top flange of the hoop and look as though they might cut right through your sticks during rimshots. Cheap hoops are also more likely to end up out-of-round, especially on larger floor toms, which will causing tuning problems. While we are on the topic of hardware, you should be able to get at least a couple "pro" hardware features with your mid-level kit, such as rubber gaskets to isolate tuning lugs and other hardware from the shells, 2.3mm triple-flange or die-cast hoops, suspension rack tom mounts, finer-threaded tension rods, virgin bass drums, etc., but none of these features is essential to getting a good sound. Keep in mind that until the mid-1980s, most rack toms had mounting holes drilled through them, and most tuning lugs were solidly mounted to, and vibrating with, the shell! Next, check the bearing edges. Don't buy a drum unless you have inspected the bearing edges, both batter and resonant side, regardless of whether the shell is wood or metal. Typically, you will be looking at drums with the heads already mounted, so you will want to run your finger all the way around each bearing edge, pressing down lightly on the head to ensure you can feel the edge underneath. Dents, divots, or low spots will affect the sound of the drum and create tuning difficulties. If you are considering a drum that has what appears to be a minor bearing edge defect, I strongly recommend de-tuning, re-tuning, and playing the drum yourself before buying it. When buying drums online, ask the seller for photos that clearly show the condition of the bearing edges on both sides, and make sure you can return the drum if you discover bearing edge defects when it arrives. Don't assume new drums will be free of bearing edge defects! All of the bearing edge issues I have encountered have been with new drums. In the process of looking at brass snare drums several months ago, I noticed that several examples of the same model drum (at multiple music stores) had dents in the bearing edges. I also noticed that the drum shipped with a drum key loose in the box...hmmm. Shells also need to be round and true (no gaps in bearing edges when sitting on a perfectly flat surface), both of which are more difficult to confirm prior to purchase, but are covered under warranty with new drums. Last but not least, while I believe that drum shell composition is over-hyped by the manufacturers, the hardness of the wood will have an impact on the sound of the shell. Modern mid-level drum shells are typically composed of one of the harder varieties of maple or birch, and sometimes oak. Poplar, basswood, and African mahogany are too soft to be the primary wood in a drum shell, in my opinion, and bubinga, hickory, and rosewood are too hard. I would avoid hybrid shells that include the softer woods, as there is no way for you to be sure how much maple or birch you are actually getting, although this is less of a concern with vintage drums from well-known drum manufacturers. Hybrid shells including the harder woods are typically beyond the price range of a mid-level kit. What I have found is that maple sounds great to my ear--a bit warmer than birch (as it is a bit softer)--but birch records better as it provides a natural boost in the high and low frequencies (often described as "naturally EQ'd"). I think what helps birch in recording is the improved "attack" (better defined initial strike) that comes with the high frequency boost. In summary, you want a set of drums with shells that will sound great in the venues where you play, and that will tune up easily! That's really the point of all the previous discussion. Once you have narrowed your list to drum kits with good shells, your final decision will depend on the number and sizes of the drums you need, desired wraps/finishes, and price. And now is a good time to discuss budget. Keep in mind that assembling a great sounding drum kit involves five separate purchases: (1) a solid shell pack, (2) upgraded heads, (3) a quality snare, (4) good cymbals, and (5) decent hardware. Remember to budget for any of these additional items that you do not already own. While you may find what appears to be a great price on a package deal from time-to-time, don't get your hopes up! It is highly unlikely that all of the components in the package will work out. Trust me, every time I buy a pre-pack or take advantage of a combo offer, I end up having to make additional purchases to replace sub-par components in the pack, and then trying to unload the unwanted components on eBay. With drums, you will not save any money buying in volume! Selecting heads, snare drums, cymbals, and hardware is beyond the scope of this blog post. However, there is one important hardware tweak to be aware of if you purchase a shell pack with 1.6mm (thickness of the metal) triple-flange hoops. While 1.6mm hoops are commonplace on mid-level kits, it is also fairly commonplace to find out-of-round 1.6mm hoops in floor tom sizes. As a result, if your new kit comes with 1.6mm hoops, I highly recommend that you upgrade your floor tom hoops to 2.3mm triple-flange (or die-cast, if you prefer) hoops at your next drum head change. I replaced the 1.6mm hoops on the floor toms of my PDP X7 and FS kits with 2.3mm hoops. While I only had one floor tom that was difficult to tune, in my opinion, this upgrade eliminated the only weak spot in either of these excellent mid-level kits, The problem floor tom tuned up with ease with its new 2.3mm hoops. Hopefully this provides some useful guidance to those of you in the market for a quality mid-level drum kit!